During the mid-1990s, most compensatory mitigation was implemented by permit applicants (permittee provided mitigation). Unfortunately, the success rates of such efforts were often poor, with as much as one-half of all projects failing to meet success criteria. In 1997, the legislature founded the Wetlands Restoration Program (WRP), a wetlands-oriented mitigation program for development under the N.C. Department of Environment and Natural Resources (NCDENR). WRP gave permittees an alternative mitigation option and allowed the state to improve the science and success of mitigation projects and to utilize watershed planning to focus the projects in the areas of the state where they were most needed. During the late 1990s, the N.C. Department of Transportation (NCDOT) began to experience increased project delays in its transportation-infrastructure program because of unavoidable environmental impacts in its development projects. In 1999, NCDOT began utilizing WRP to meet a portion of its mitigation needs. The NCDOT and NCDENR mitigation programs functioned independently with different operating processes, a situation that failed to meet the satisfaction of either federal and state regulatory agencies, or environmental interest groups. (NOTE: WRP was later absorbed into the Ecosystem Enhancement Program (EEP). 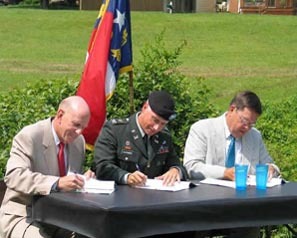 To address this situation, a cooperative process-improvement initiative in North Carolina involving more than 10 state and federal natural-systems agencies convened in 2001. Obstacles identified in the initiative included inadequate communication, undefined roles and responsibilities, poor synchronization in executing existing mitigation and permitting processes, and a lack of clearly understood mitigation-success objectives. This panel's conclusions led to recommendations that mitigation for NCDOT should be provided years in advance of project impact, and be designed to replace unavoidable functional losses to wetlands and riparian buffers. The panel also conceived and set into motion events leading to the creation of the Ecosystem Enhancement Program (EEP). In 2015, the Ecosystem Enhancement Program (EEP) changed its name to the Division of Mitigation Services (DMS). DMS continues to achieve its mission to restore and protect North Carolina’s natural resources for future generations while supporting responsible economic development. The initiative restores streams, wetlands, and riparian buffers where the need is greatest by working with local and state partners, including willing landowners. And NCDOT and other developers voluntarily use DMS to move projects forward in a timely and affordable manner.